Today you are going to read our complete zebco 33 review. Fishing does not only serve as a source of income but it is also a popular sport and an ideal activity for recreation. But in order to get the best out of any activity it is important to have the appropriate equipments and in fishing you cannot do without a good fishing reel. Fishing reels come in various types and in different makes and sizes. Today we are going to zebco 33 review a spincast reel. Zebco models are crafted with the highest standards in spincast fishing reels technology and the Zebco 33 authentic spincast fishing reel is no different. Spincast reels in general are the easiest reels to use and are ideal for both beginners and the more experienced anglers. The greatest aspect of the spincast reel is the push-button mechanism which starts off the process of releasing the line to be tossed in water. Anyone can take it on from there by following some easy steps. The Zebco 33 is a simple yet highly developed tool that comes along with some amazing features to provide you with the best fishing experience. We have decided to look at some of its main traits and find out how and why it stands out from all other reels and what makes it a good tool to own. If you want your fishing reel to last you for a long time then you must first find out what it is made of. Graphite, plastic and aluminum are some of the materials used on the body of spincast reels, with aluminum being the preferred material for most high-end reels. This reel however is made of lightweight graphite which is also a popular choice for most spincast reels as it repels corrosion better than aluminum. It is tough and can withstand bad weather as well as unpleasant water conditions. Although freshwater fishing is best suited for this kind of body, it can also be used in saltwater, provided you clean and maintain the tool well after each use. The cover on this reel is made of stainless steel which also adds to its durability and it comes in a typical classic design. The ball bearings on a spincast reel determine how smoothly your reel will operate. This model has an amazing ball bearing drive which provides excellent sturdiness and support to the reel. This results in better performance. You will love the drag system on this reel. It applies just the right amount of pressure on the hooked fish and lets out enough line to tackle a hard fighting catch. Without a reliable drag you cannot expect to catch a good number of fish but with the micro fine adjustable drag control on this tool you can not only enjoy a smooth drag but also control the amount of drag required. The control range is quite impressive where you can actually tighten the drag to a maximum point and loosen it quite a bit too to prevent the line from snapping. For those of you who do not understand the concept of gear ratios on a reel, we will first explain what it actually means before we talk about the number on this model. Gear ratios tell you exactly how many times the line rotates around the fixed spool when you turn the handle once completely. The gear ratio that you get here is 3.6:1 which means that the line goes around the spool 3.6 times for every single and complete turn of the handle. Spincast reels generally have lower gear ratios when compared to spinning reels or baitcast reels but they are just about enough for small to medium tackles. Line retrieve with a gear ratio of 3.6:1 does not carry too much speed but has enough power to retrieve smoothly. It also prevents extreme fidgeting and noise after a cast. The Zebco 33 authentic spincast fishing reel has many useful features which contribute in making this a great all-around fishing reel. Reversible handle– You can change the handle for a right or left hand retrieve. This makes the tool versatile and great for anyone using the reel, despite their preferred side of retrieve. Bite Alert– If you choose to have the alert on then you will notice a loud ticking sound as soon as something hits the line. This feature allows you to act quickly and retrieve your line, hopefully with a fish on the other end. Quick Set Anti-Reverse– This stops your reel from unwinding as soon as the fish is caught and makes a run for it. You get a good grip on the reel and can retrieve with more control. Great for both youngsters and adults. Some users said that the reel could not retrieve the line. This may be due to a faulty model. Question: Will this reel work with an 8lb test line? Ans: Yes it should work just fine. Question: Is this a large reel or a smaller one? Question: How durable is this reel? Ans: The stainless steel cover on this reel makes it very durable. Although it has some plastic parts, you can make this reel last you for a long time provided you oil it and keep it clean. 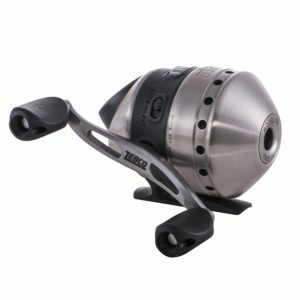 We would recommend the Zebco 33 authentic spincast reel whether you are a newbie or a professional because it is an affordable reel that comes with new and improved features. The modern mechanism on this reel not only allows you to learn how to fish within a very short time but also makes your fishing experience a pleasurable one. The classic design and lightweight body makes it ideal for children too and it would make a great gift for anyone who has a love for the sport of fishing.